Given he has already worked for the club as a player and coach of ‘B’ team, Lopetegui believes he has a head start. NEW REAL MADRID coach Julen Lopetegui thinks his familiarity with the demands and expectations of the club following his previous spells there will serve as an advantage to his chances of success. Madrid found themselves without a coach less than a week after winning a third successive Champions League title, as Zinedine Zidane – the mastermind behind those triumphs – opted to step down. Just three days before Spain’s World Cup campaign was due to start, Madrid revealed Lopetegui – who was in charge of the national team – was to take over upon the completion of the World Cup, an announcement that resulted in the former goalkeeper being sacked. Lopetegui is now fully focused on attempting to successfully replace Zidane and, given he has already worked for the club as a player and coach of ‘B’ team Real Madrid Castilla, the 51-year-old believes he has a head start. 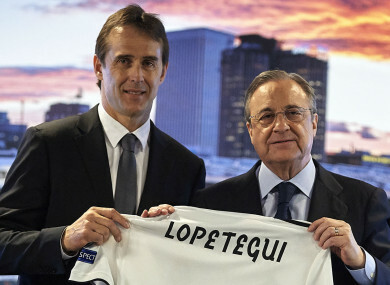 “Without any doubt it is an advantage to know the club, the essence, the ‘Madridismo’ and what the fans want and demand,” Lopetegui told the club’s official website. “Because, apart from winning, there’s a code demanded that is always present and important. That is the pride of Real Madrid. One major difference between Lopetegui’s Madrid and Zidane’s will be the lack of Cristiano Ronaldo, who departed for Juventus in a €112 million deal. Nevertheless, Lopetegui does not seem affected by Ronaldo’s exit, adamant the club is in good shape to compete. “We have a magnificent team,” Lopetegui said. “I have been in Valdebebas [Madrid's training base] and there are no words to define it. “There are also no words to define the love I felt in the presentation. I like everything. “Focusing on the job of coach, I have a very good staff, regardless of what happens and that there will be nuances and situations that will be solved in these weeks. Email “Familiarity with Real Madrid an advantage, says Lopetegui as he fills Zizou's shoes”. Feedback on “Familiarity with Real Madrid an advantage, says Lopetegui as he fills Zizou's shoes”.